Another summer has come and gone, along with our Broker Day and Agent Awards and Retreat. Rick and I want to thank our CEO, Tami Bonnell, Rick O’Neil and Shereese Seevers for their great contributions for our entertainment. Congratulations to all our award winners, especially Boyd Grainger, EXIT Landmark Realty, Agent of the Year; Chris Underwood, EXIT Premier Realty, Broker of the Year; and “Special” Ed Haraway, EXIT First Realty, Energy Bus Spirit Award! Rick and I want to thank our son, Rodney Huff, for updating our Energy Bus. He drew the bus by hand with pencil and ink. It involved many hours and weeks of tedious work to achieve perfection. His art degree from the University of Delaware has made us proud! Now it’s time to focus on our EXIT International Convention, which is in our own backyard! Mark your calendars for October 16-19 at the Gaylord National Hotel in D.C. It will be a great event and we hope we see everyone there! Keep Our Energy Bus Rolling! Click here for the September 2018 EXIT Mid-Atlantic Newsletter. If there’s one thing being in the real estate industry over the past 30 years has taught me, is that…it is crucial to take time off from time to time. We get so wrapped up in the everyday routine of our lives that we forget to stop and recharge our battery and focus on what is important to us. Taking time off could be as simple as spending a day with your family (with the phone shut off! ), or traveling to an exotic place you’ve always thought about going. It doesn’t matter what you choose to do…Just Do It! A big “life lesson” I learned while working with hospice for three years is life is too short. Don’t procrastinate having FUN in your life! It’s summertime!! Kick off your shoes, high heels, boots or flip flops and wiggle your toes in the warm sand and frolic in the cool, refreshing pool, lake or ocean. Four months from now, you’ll look back and smile, remembering how GREAT your summer of 2016 was! You can prepare for Erica Nasby's visit to our region, and learn a valuable life lesson at the same time. Erica Nasby has recently uploaded her webinar "Vitamins for the Soul." Tune in to the EXIT Realty YouTube channel and watch this, among other, helpful videos. This addition from Erica is a great complimentary personal growth topic that is sure to get you geared up and ready for her Field Day Workshop tomorrow, July 21st, and Friday, July 22nd. Through individualized, personal coaching and multiple series' of motivational and dynamic conferences, Erica is allowing brokers and agents to recognize their earning potential as well as maintain their path to following the goals they set through their participation. The EXIT Mid-Atlantic region warmly welcomes her, and is excited for the opportunity to gain more insight through her expertise. EXIT Realty Corp. International has always taken a holistic approach to the well being of its Associates. EXIT Realty recognizes that a person’s emotional, physical and spiritual well being are keys to their overall quality of life. To this end the company’s Focus on Good Health initiative includes a series of articles, tips and tools promoting wellness at work and at home. With a wealth of powerful contributors to their website (www.focusongoodhealth.com), the site contains valuable information from general health and wellness tips to recipes and suggestions for further reading and guidance. You can also check out any upcoming face-to-face, or webinar events to help you get started with finding your healthier way of life, or to keep you on track. This great new initiative also provides you with a daily dose of health and wellness tips to get you through each day of the month. June 27th reminds you to smile even when working with a difficult coworker. June 28th suggests you take your shoes off before entering your home to avoid tracking dirt and germs throughout. As if the EXIT Formula itself wasn’t enough, EXIT Realty has found yet another way to improve the lives of their Brokers and Agents, and, thereby, anyone they come in contact with. “Good health is the basis of a great life,” says Steve Morris, Founder and Chairman of EXIT Realty Corp. International. We make a lot of choices throughout the course of our lives, and many of them stem from two underlying thoughts. Victoria Rivadeneira spent time with our region’s Brokers on Thursday, June 2nd to talk about whether we are making critical life decisions based on love, or out of fear. One of the topics in her book, “Create A Real Estate RIVAlution,” that she touches on is which of these two emotions is driving our decisions. She challenged our Brokers, and all of her readers, to find what it is they love career-wise and work hard to achieve that role. She proposes that if you love what you do, you will do your absolute best at it every day and feel ultimately fulfilled. However, if you are doing your job out of fear, primarily being afraid your bills won’t be paid if you don’t, you are doing it for the wrong reason and won’t be as motivated to strive for your absolute best day in and day out. She said she has come to realize those who don’t love real estate are not just doing themselves and injustice, but also their clients, Brokers and fellow Agents. A coinciding challenge she knows Agents and Brokers face even after entering the industry out of love, is maintaining their humble nature. At some point in your real estate career, as you are doing what you love, you will be faced with great successes to tout. That will be your defining moment to ensure your ego remains in check. Ruthless behavior and over indulged egos are what Victoria would like to see weeded out of the real estate industry. She challenges Agents and Brokers alike to remember they got into this industry because they truly wanted to make a positive difference in the lives of those around them. She fears you lose sight of that goal when you are more focused on your wins, only moving yourself and your office toward a more ruthless and hostile business practice. All-in-all, Victoria reminds real estate Agents and Brokers to, first, figure out whether or not they truly love their role in real estate, or if they are just doing it for a paycheck. From there, simply remember to start and end each day working for the “power of love,” as opposed to the “love of power.” With that, not only will you be able to celebrate more wins than you can count, but you will also have everyone around you celebrating alongside you, helping you to reach even greater goals. EXIT Mid Atlantic was happy to host Tami Bonnell, CEO of EXIT Realty Corp. International, at our 2016 Broker’s Retreat. It was during her talk when she gave our team of ambitious professionals a great life lesson, everything in life should be “an opportunity to…” She encouraged our team to look at every success, every failure, every interview, every employee hiring, every employee firing, every new sale and every lost sale as an opportunity to grow and learn. Tami told our Brokers that even when she has perform one of the hardest functions of being a manager and let an employee go, she sees it as a growth opportunity for herself, and makes every effort to deliver the message to the employee as an opportunity for them to grow and possibly find their true calling. She gave an example of an employee she had to let go who turned that experience into an opportunity to pursue her passion for nursing and is, today, still very satisfied with her rewarding work in a hospital. As we are faced with varying levels and types of opportunities on a daily basis, we have to make sure our work is one of those opportunities we don’t take lightly; you have to do this every day of your life, you may as well enjoy it. “Your head leads you in a direction, but your heart needs to follow,” was advice given by Tami during her talk. Every opportunity you are presented with should be another step in the direction of your life’s passion and goals. If your heart isn’t truly in what you are doing, you should probably be doing something else. Your head told you that is where you need to be, but if you don’t feel fulfilled at the end of each day you will find yourself, one day, not giving it your all. We know our Brokers give 110% because we know they have found their passion, now they are being challenged and empowered to seek out those agents who also have a passion for real estate. Mary Eldridge and her EXIT By the Bay Realty team are making plans to show their continued support on Saturday, June 4th, to fight for a cure for cystic fibrosis. This fundraising event hits especially close to home as one of our extended EXIT family members suffers from this disease, Mary Eldridge’s daughter, Lindsey. Lindsey bravely fights this battle every day, but on June 4th, you and EXIT By the Bay can fight with her. Based on the poem The Guy in the Glass by Dale Wimbrow. Recently published in the EXIT Achiever. When you get what you want in your struggle for self, and the world makes you king for a day, just go to the mirror and look at yourself, and see what that guy has to say. For it isn’t your father, or mother, or wife whose judgment upon you must pass. The fellow whose verdict counts most in your life is the one staring back from the glass. He’s the fellow to please, never mind all the rest, for he’s with you clear to the end, and you’ve passed your most dangerous, difficult test if the man in the glass is your friend. You may be like Jack Horner and chisel a plum, and think you’re a wonderful guy, but the man in the glass says you’re only a bum if you can’t look him straight in the eye. You may fool the whole world down the pathways of years, and get pats on the back as you pass, but your final reward will be heartache and tears if you’ve cheated the man in the glass. EXIT By the Bay Realty Introduces Agent Tammy Vitale! EXIT By the Bay Realty would like to introduce a new agent to the company, Tammy Vitale. Although Tammy is new to EXIT By the Bay Realty, she is not new to the real estate market. She loves to work with buyers and sellers, but her passion is buy-and-hold investment houses. She works all of Southern Maryland and just south of Central Prince George’s County in the Largo area where she owns a rental townhome. Her favorite locations to work include Huntingtown, North and Chesapeake Beaches, and California/Hollywood in St Mary’s. Tammy has been a buy-and-hold investor of real estate since 1999. She will be celebrating one year as a real estate agent this April. Since then she has completed The Graduate REALTOR® Institute (GRI) through the Maryland Association of Realtors. GRI is the mark of a real estate professional that has made the commitment to provide a high level of professional services by securing a strong educational foundation. Aside from real estate, Tammy attended Trinity University in D.C. where she obtained a bachelor’s degree in business administration. Tammy also attended Goddard College in Plainfield, VT where she graduated with a Master’s in story and social change. With these degrees she has had extensive experience working as an employee, program director, and executive director of small non-profit organizations, which include building organizations from the ground up. She has excellent speaking and written communication skills which help her to be able to go through contracts, and advocate for her clients. Tammy skillfully manages multiple projects at a time, making every client feel like they’re her only client. Since being at EXIT By the Bay Realty she has won Top Listings and Top Contracts. “I have worked with Tammy on housing issues, water issues, and in art. Tammy listens attentively and works cooperatively to ensure that needs are met. She is tireless in what she does and has impeccable attention to detail. Tammy asks questions to make sure she understands what is needed and puts forth her best effort in all that she does. I would work with Tammy on any project at any time. You can’t do better.” – Anne R. Mechanicsville, MD. Tammy was born in D.C. and raised in Arlington, VA. She spent the 70’s in Fort Lauderdale, FL., but now lives in Lusby with her husband, of 31 years, and their pug, Gracie. They have two children, a son and a daughter. Their daughter has blessed them with a granddaughter and grandson. While travelling with her family, she enjoys looking at the local houses and neighborhoods. Tammy is also professional artist, mostly working with clay. Tammy designed, created, and installed a 7.5’ x 11’ ceramic piece for the North Beach Boardwalk Visitor’s Center. 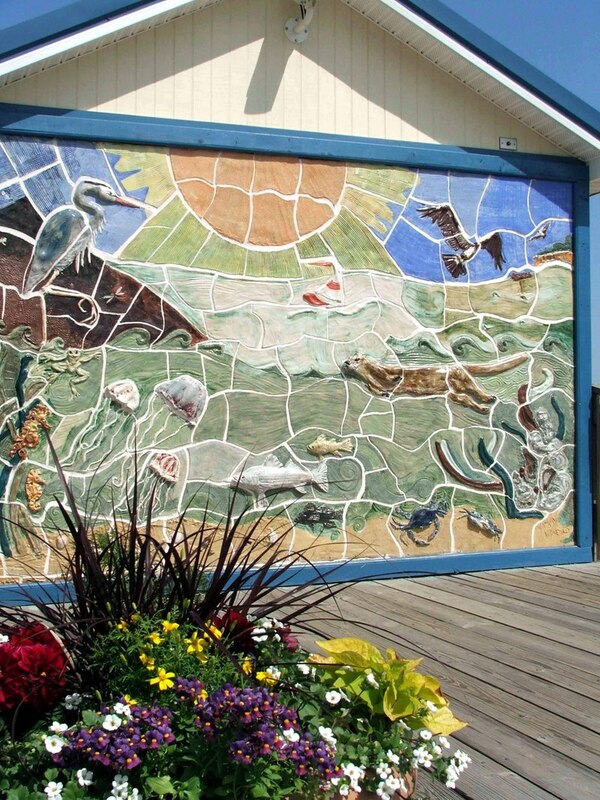 She also designed the Summer/Fall/Spring mosaics in North Beach’s new Sunrise Park. Tammy also enjoys making her own jewelry, reading, and spending time browsing through Facebook and Pinterest. The Thanksgiving holiday is approaching rapidly. With only twenty-five days left to plan, let us help you with a few simple recipes to make your holiday meal a success! Each family has their own tips and tricks and there seems to always be a “secret” ingredient. If you are not much of a cook, that’s okay! Some of my personal favorite recipes are simple and delicious! In my opinion, the hardest part about thanksgiving is trying to fit through the front door after you’ve consumed so many amazing foods and desserts. Perhaps a personal challenge should be to have a “no carb November” in preparation for the upcoming calories. But then again, bathing suit season is a long ways away…I will just remember these calories with my new year’s resolutions. So here are a few of my favorite Thanksgiving recipes that are easy and always a big hit. Some I have gathered from magazines or Pinterest over the years but I always adapt them to best fit the “tastes” of whoever I am entertaining. Bon Appetit! Directions- Preheat oven to 350 degrees; Break up sausage into small pieces and cook in a large skillet with dried sage; melt butter in large pot over medium heat, add onions and celery, cook until soft and opaque, stir often; remove from heat; add chicken stock, stuffing mix, sausage, salt & pepper and mix thoroughly. Spoon mixture into a large greased Pyrex container and top with some leftover butter, bake for around 30 minutes. Make sure you do not overcook or this will dry out. Directions- In a large pot, combine and cook the potatoes & garlic with enough salted water to cover potatoes a few inches, in another saucepan, cook cream on low and bring to a simmer, remove from heat and add butter to melt, drain the potatoes and garlic and return to the same pot and mash the potatoes, add the cream mixture to the potatoes, salt & pepper to taste. Directions: Preheat the oven to 375 degrees; cook macaroni noodles and drain; mix together the milk and eggs and set aside; place 2lbs of cheese in the bottom of a large pyrex glass container; pour milk mixture overtop the cheese; slice your stick of margarine and put on top of the mixture; pour in your cooked noodles and make sure all is mixed in well; if you have any extra cheese, sprinkle more on top and bake for approximately 45 minutes. The top will brown and you will know it is ready! My name is Dena Mixon and I would love to be your West Columbia/Lexington, SC REALTOR! I am professionally trained and experienced to help home buyers and home sellers in the Midlands of South Carolina. I work very hard to help clients achieve their real estate goals. I can promise that I will always give you the care and best possible service that I can give! Whether you are selling, buying or just have a question, please call or text me at (803)348-1155. EXIT Real Estate Consultants. 1320 Knotts Haven Loop, Lexington SC is For Sale! 301 Saddlebrooke Rd in Lexington SC is for Sale!